Local officials wouldn't allow Air Canada to board the passengers. 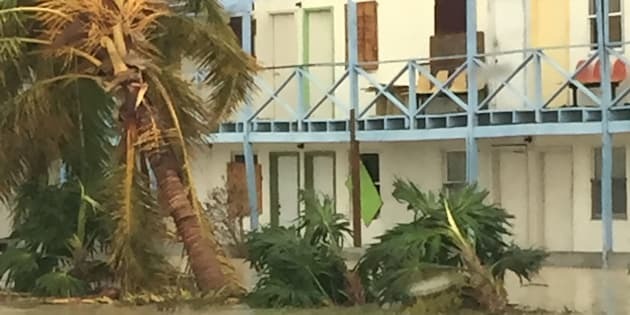 Palm trees lie in the water in the aftermath of Hurricane Irma in Providenciales, Turks and Caicos Islands on September 8, 2017, one day after the Category 5 storm skirted the region. Air Canada says about 100 Canadians who had been barred by local authorities from a flight leaving Turks and Caicos will now be allowed to fly home. Hurricane Irma caused extensive flooding in the islands last week, with water reaching above the waist in some areas. Air Canada spokesman Peter Fitzpatrick says the company was planning on using a chartered plane to evacuate 95 Canadians who had been staying on the islands, but civil aviation authorities wouldn't allow the passengers to board the flight. Fitzpatrick says the main airport terminal on the islands is closed, but humanitarian flights have been allowed to operate. He says authorities in Turks and Caicos have now agreed to let Air Canada operate the return flight, which is scheduled to leave Monday afternoon. Fitzpatrick says the Canadians are expected to arrive in Toronto Monday evening.